The premise for the lawsuit, as given by Linn County, is false. According to their press release, a lack of state forest logging since 1998 has had “devastating effects” on economies in the forest trust counties and unemployment and poverty have “skyrocketed” because of the state’s management practices. This is simply not true. Since 1998, state forest harvest levels increased significantly. In 2015, timber harvest on federal and private lands in Oregon declined while state forest harvests maintained. Since 1998, state forests have provided a high and stable volume of timber. This lawsuit seeks to increase logging levels on state forests. Linn County’s attorneys have consistently misled the public as to the true nature of this lawsuit., claiming it is only a contract dispute between the counties and the state. If that were the case, why would the logging industry have developed and paid for the lawsuit? 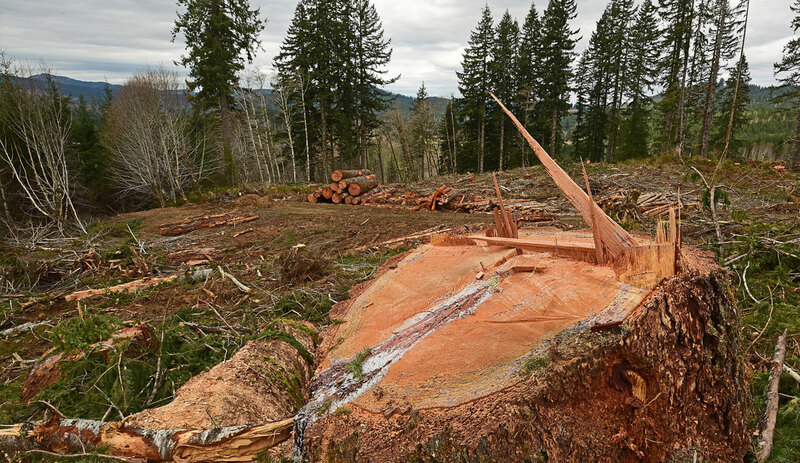 Hampton Affiliates, Stimson Lumber, and the timber lobbying group Oregon Forest Industries Council are licking their chops for a bigger piece of the pie. They are hoping that, as part of a settlement, state forest clearcutting levels increase. Or, they rightly assume that, if the lawsuit succeeds, the state will be forced to depart from its current, balanced approach to avoid being sued again. Drastic harvest increase is not economically sustainable. As part of a process to examine new approaches to managing state forest lands, the Oregon Department of Forestry modeled what an increase in clearcutting would look like. The results were not promising. It turns out that when you liquidate your asset by intensive clearcutting, the returns don’t last long. The model showed that such an approach would pay for itself for about 25 years, after which costs far outpace revenue, leaving the Department financially insolvent. Additionally, Department staff noted that implementing this plan would result in less harvest than predicted and that there is a likelihood that counties and forest district would face drastic boom/bust cycles rather than steady, predictable income. This is what a moderate harvest increase looks like, a drastic increase would no doubt be far worse. Increased harvest presents serious ecological problems. During the process to explore new management approaches to state forests, a third-party science review of several approaches was conducted. The industrial timber approach is modeled as the “Timber Harvest Optimization” (THO) alternative. Findings indicate that this approach result in 1) “lower carbon stocks in the forest;” 2) “reduced amount and diversity of vegetation;” 3) increased stream temperatures and sediment; 4) decreased non-motorized recreation, non-timber forest products, and fishing; 5) decreased habitat for nearly all types of wildlife (including threatened and endangered species); and 6) increased herbicide us. (See series of tables (4-4 to 4-10) for many of these indicators). The Oregon Board of Forestry currently has a collaborative, science-based process to explore new management approaches. For several years now, the Board of Forestry’s “Alternative Forest Management Plan Subcommittee” has been hard at work on re-examining how to manage state forests for long-term financial viability and improved conservation. The subcommittee has consistently sought public input, the best available science, and input from the forest trustland counties. These counties have a “special” seat at the table with the Board of Forestry and the Department of Forestry. By staying in the lawsuit, counties would be forgoing a seat at that table in exchange for a seat on the timber industry/Linn County funride through the court system, where input is likely limited and forest plans are not typically written. Our fisheries economy will suffer. A move towards industrial style timber production would have a severe impact on the local fisheries economy. On the north coast, recreational, and sport fishing are a cultural touchstone and a serious economic engine. In 2008, sportfishing ALONE in Tillamook and Clatsop Counties amounted to a $49 million dollar industry without counting equipment expenditures, which are significant. Many guides and fishing shops rely on healthy forested watersheds for their livelihood. We don’t want a paralyzing legal battle on these forests. Current state forest timber harvest levels are high – over 5,000 acres will be clearcut in the Tillamook and Clatsop next year alone. State forests make up 3% of Oregon’s forestland but produce between 8-10% of our timber volume, depending on the year. Asking more of these already productive lands could be dangerous. There is already notice of intent to sue the state for “taking” threatened coho salmon. Cranking up the harvest dial seems unwise, especially after federal agencies have found Oregon’s logging rules inadequate for protecting water quality. Recreation will suffer. The Tillamook State Forest provides critical, publicly accessible recreation opportunities for coastal communities along with residents of Washington County, which is growing rapidly. These forests provide the closest hiking and biking trails, low-cost campgrounds, rivers for fishing, swimming, and boating, hunting access, and wildlife viewing. In Clatsop County, the Clatsop State Forest represents the only large piece of public land for recreation. Increasing clearcutting, roads, and logging activities will be detrimental to these activities which improve quality of life and are a key economic engine for Oregon. The lawsuit could be devastating to Oregon’s already stressed budget. Our state currently faces an approximate budget shortfall of $1.7 billion in the next biennium. If Linn County and the timber industry gets their way, that number would nearly double. Linn County and its attorneys pretend that the case is simple but they offer no solution on how the state’s taxpayers would generate an extra $1.4 billion without raising taxes, clearcutting more, and shutting down crucial state programs. As of the end of October, the lawsuit had cost the state roughly $503,000 not including Department of Forestry staff time. The lawsuit is an attempt to make a few people wealthy at the cost of all Oregonians. While we don’t know where settlement money would come from, we know where a lot of the money will go if the lawsuit succeeds: John DiLorenzo and his law firm stand to make out with $210 million for representing Linn County and the timber industry. Add this to the increased clearcutting that companies like Stimson and Hampton are hoping for, and it’s clear that Oregonians—all of us—whether through increased taxes, lower water quality, environmental degradation, or loss of forest opportunities, will be left holding the bill. It’s time to opt out of this destructive, misleading lawsuit.